Votivo Large Red Currant Candle is simply one of the most famous and well-known candles in the world. Green. Citrus. Cassis. Geranium. Earthy Green & Fruity Musk. The candle exudes a rich fragrance of the red currant berry. Supersize your Votivo Aromatic Candle experience with the 16.2 oz Large Candle. Enjoy your favorite fragrance even longer with a burn time of up to 100-110 hours. 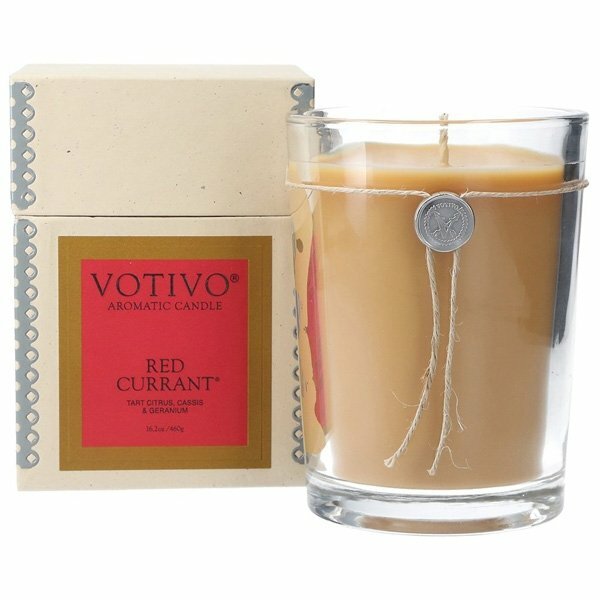 Votivo Red Currant candle is the ORIGINAL red currant. Accept no substitutes. The full-bodied aroma of Votivo Aromatic Candles will fill your home with a lingering bouquet. With fragrances that are famous for their ability to quickly fill a room with complexity and depth, each candle is blended with the finest wax and rich fragrances.